About this Bullet Clip For Sunglasses:The plastic Bullet Clip is the perfect item for everyone with a pair of glasses of any sort! Sunglasses, Bifocals, Reading glasses, even your kids 3D glasses can all be held with the Bullet Clip!Easily clips to car visor, seat-belt, or bag strap for convince. Make sure your customer never losses their glasses again and has your brand to thank for it! The Bullet Sunglasses Clip comes in Multiple colors with tons of imprint color options!Special Instructions:1 Day Rush, available upon request for 1 color, 1 imprint location orders. About this Folding Retro Sunglasses:The all American classic folding retro sunglasses are the perfect give away item for any event. With several arm color and screen print color options to choose from you can be sure your brand is looking good in the sun for that summer fun! Your customers can wear these anywhere, making sure your brand gets the exposure you want. Protects from UV rays. Assortment options available.Special Instructions:1 Day Rush, available upon request for 1 color, 1 imprint location orders. About this Aviator Sunglasses:UV400 Lenses Provide 100% UVA And UVB Protection.Special Instructions:Rush Service:Catalog Quantities Only.One Color And One Location. About this Crystalline Mirrored Malibu Sunglasses:Made Of Polycarbonate Material.UV400 Lenses Provide 100% UVA And UVB Protection.Mirrored Lenses.Special Instructions:Rush Service:Catalog Quantities Only.One Color And One Location. About this Neon Sunglasses:Features brightly colored neon or black temples with a black frame. Ultraviolet-protective lenses with UV 400 rating to protect your eyes from the bright sun. Floats in water.Special Instructions:Rush service: 1-color/1-position required. Item color assortments are not available. About this Fashion Sunglasses:Polycarbonate sunglasses with 100% UV protection. One size fits all. NOTE: Product comes with Prop 65 warning label. Label reads: "WARNING: This product may contain carcinogen, which is known to the State of California to cause Cancer and Reproductive Harm. For more information, go to www.P65Warnings.ca.gov. Special Instructions:Rush : 1. Catalog quantities only.2. Valid only for the standard number of imprint colors/positions included for each item. About this Sun Fun Sunglasses:Frames change color in sunlight.Frosted glasses change to Blue, Orange, Magenta or Yellow. Color intensifies with strength of UV rays.PC lens with UV 400 protection.Special Instructions:1 Day Rush: 1 color, 1 location. PMS color matches are not available with 1 Day Rush. About this Neon UVA UVB Protection Sunglasses With Multiple Color Choices:Kick off your next marketing campaign in style with these trendy sunglasses! With temples in neon colors and black frames these colorful accessories offer high fashion appeal! They provide 100% UVA and UVB protection from the sun and are buoyant to float in water; making them ideal for beach themed events and boardwalk retailers. Have your name or logo printed on the temple and use the finished product as a party favor! NOTE: Product comes with Prop 65 warning label when shipped to California. Label reads: "WARNING: This product may contain carcinogen, which is known to the State of California to cause cancer. For more information, go to www.P65Warnings.ca.gov. About this Cool Sunglasses:Accessorize your outfit with these fashionably cool sunglasses! Offering 100% UVA and UVB protection for the harmful rays of the sun, these assorted colored glasses will also help build your brand awareness. This profile-raising merchandise is fitting for tradeshows, resorts, fundraisers, or amusement parks. Have your company name or logo printed on the temple and make this promotional product a must-have fashion accessory! NOTE: Product comes with Prop 65 warning label when shipped to California. Label reads: "WARNING: This product may contain carcinogen, which is known to the State of California to cause cancer. For more information, go to www.P65Warnings.ca.gov. About this Sun Fun Sunglasses, Full Color Digital:Frames change color in sunlight.Frosted glasses change to Blue, Orange, Magenta or Yellow. Color intensifies with strength of UV rays.PC lens with UV 400 protection. About this Sun Ray Sunglasses:Classic folding eyewear.UV 400 protection.Material: Plastic.Special Instructions:1 Day Rush, available upon request for 1 color, 1 imprint location orders. About this Tropics Sunglass Strap:Personal eyewear tether.Keeps eyewear securely around your neck.Material: Neoprene.Special Instructions:1 Day Rush, available upon request for 1 color, 1 imprint location orders. About this Paradise Sunglass Pouch:Sunglass pouch with drawstring closure to keep your sunglasses protected from scratches and smudges. Material: Microfiber.Special Instructions:1 Day Rush, available upon request for 1 color, 1 imprint location orders. About this Allen Sunglasses:Classic folding eyewear in trendy wood-look finish.UV400 protective lenses.Material: Polycarbonate.Special Instructions:1 Day Rush, available upon request for 1 color, 1 imprint location orders. About this Maui Sunglasses:Two-tone matte finish fashion sunglasses feature tinted UV400 lenses providing 100% UVA and UVB protection. Finish / Material: Polypropylene.Special Instructions:Rush Service:1. Purchase Order must clearly state artwork instructions and logo to be used.2. One Color/One Location Imprint Only. About this Patrol Sunglasses:Aviator style sunglasses feature steel rims, nose pads & plastic ear protectors and UV400 lenses that provide 100% UVA and UVB protection. Finish / Material: Plastic, Steel.Special Instructions:Rush Service:1. Purchase Order must clearly state artwork instructions and logo to be used.2. One Color/One Location Imprint Only. About this Sun Ray Sunglasses - Mirror:Classic folding eyewear with different colors of UV400 protective mirrored lenses. Material: Plastic.Special Instructions:1 Day Rush, available upon request for 1 color, 1 imprint location orders. About this Retro Sunglasses - Solid:Classic folding eyewear. UV400 protective lenses. Material: Plastic.Special Instructions:1 Day Rush, available upon request for 1 color, 1 imprint location orders. About this Retro Sunglasses - Spirit:Classic folding eyewear. UV400 protective lenses. Material: Plastic.Special Instructions:1 Day Rush, available upon request for 1 color, 1 imprint location orders. About this Slazenger(TM) Pilot Sunglasses:Timeless Aviator style sunglasses from Slazenger™ offer high quality construction and rugged good looks. Comes with the signature Slazenger Sunglasses hard case that will ensure these sunglasses stay safe and last you a long time. Comes with Slazenger Sunglasses soft cleaning cloth with Slazenger™ print. Manufactured By Leeds. Note: Instructions Included: No Materials: MetalSpecial Instructions:Other imprint methods/areas may be available; please call for details. Please note that product images may not depict the standard imprint method included in pricing. About this Sun Ray Sunglasses - Electric:Classic folding duo-tone color eyewear. UV400 protective lenses. Material: Plastic.Special Instructions:1 Day Rush, available upon request for 1 color, 1 imprint location orders. Thank you Jonathan, Jeremy and Denise! We’re glad to read your reviews on our fun Custom Recyclable Two Tone Sunglasses. These custom sunglasses are on our Top 100 because of how fun they look! The Custom Recyclable Two Tone Sunglasses are great quality for an affordable price! These are very popular at many events and trade shows! The Custom Recyclable Two Tone Sunglasses are sure to be a BIG HIT for any event! Not only are they budget friendly, but they're a fan favorite for bringing personality and function to the table! Mix and match color options to make the Custom Recyclable Two Tone Sunglasses a staple in your branding! The Custom Recyclable Two Tone Sunglasses feature UV400 lenses and provide 100% UVA and UVB Protection for your eyes. The Custom Recyclable Two Tone Sunglasses feature a "standard imprint area" and an additional "optional imprint area" for better branding opportunities. The Custom Recyclable Two Tone Sunglasses offer rush production with qualifying imprints. Thank you Helene and Chrissy for your reviews on our Multi Color Custom Two Tone Matte Sunglasses. This item is on our Top 100 list because of its fun style! The Multi Color Custom Two Tone Matte Sunglasses are great for any event! This will definitely be the most popular item! The Custom Two Tone Sunglasses are adult-sized sunglasses. The Custom Two Tone Sunglasses feature Black plastic frames with tinted lenses. The lenses on the Custom Two Tone Sunglasses feature ultraviolet protection level UV400. The Custom Two Tone Sunglasses are available in 10 colors for easy branding! Order your Multi Color Custom Two Tone Matte Sunglasses here. Thank you Rob and Maria for your kind reviews on our Malibu Sunglasses. These sunglasses are on our Top 100 List. We know it’s the high quality and style that give these sunglasses its popular reputation. With more than 480 sunglasses and straps available in our selection, you’ll be able to find the perfect shades to promote your company. We have two tone matte sunglasses, recyclable sunglasses, clips for sunglasses, retro sunglasses, fashion sunglasses, and more! Custom sunglasses and straps are fun for bright, sunny days! Customers love to wear sunglasses, especially if they are stylish. Place your company name on your style of sunglasses, and watch your customers represent your brand! Promotional sunglasses and straps are fun for all ages! Customers will love to wear sunglasses on a bright, sunny day. Look through our selection of sunglasses and straps. Shop here! Many times event guests are bombarded with lackluster swag at every opportunity, so it is extremely important to stand out among the outdoor enthusiast in everyone. Our custom sunglasses and straps is specially priced and proven to generate impressions while promoting outdoor fun and adventure! Search our site for a wide selection of promotional shades and see for yourself how high our standards are when it comes to brand impact. Click through our inventory of promotional shades on sale now. Here is a snapshot of our selection of 511 custom shades and straps currently available. We’re ready to help expedite your order, so give us a call! Grab your sunglass swag today! Promotional sunglasses and straps are fun for any event! Sunglasses and straps are not just for summer, but for everyday of the year! 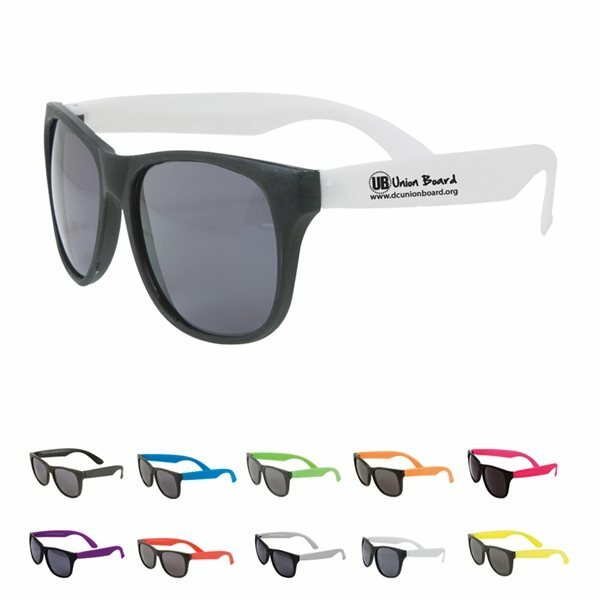 Use promotional sunglasses and straps for any trade show and event! You could implement your company message in many different ways with sunglasses and straps! Our featured list of sunglasses and straps include our top sellers in this category. Don’t miss out on this fun marketing tool that’s popular at every event!